SO MANY BEGINNINGS FOR UC GRADS Our university years are a time of new beginnings—the first professor to expand our minds, our first all-nighter, the first few moments of friendships that last a lifetime. 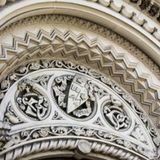 This year at the U of T Alumni Reunion, we’re planning special events for 2019’s honoured alumni—anyone who graduated in a year ending in 4 or 9. But all alumni are welcome. With more than 130 events to choose from, including two UC-specific events, there’s something for every UC grad at Alumni Reunion 2019. From 1967 to 1977, Toronto avidly pursued a major league baseball team. Citing findings from primary and secondary source research and original interviews, Maxwell Kates (BA 2001 UC) will chronicle how Toronto’s baseball dream became a reality. Maxwell’s work forms a chapter to the book Time for Expansion Baseball. Reunite with your UC classmates to celebrate the 50th anniversary of your graduation before the U of T medal ceremony in Convocation Hall. For more information or if you require an accommodation in order to attend an event, please contact UC Alumni Relations at (416) 978-2968 or uc.rsvp@utoronto.ca. DEPARTMENTS About the cover image: The cover photo was taken at the 2018 Alumni of Influence awards gala by photographer Stephanie Coffey. The painting was completed by live painting artist Olga Pankova during the event and given to Principal Ainslie as a gift from the University College community. opportunity to interact with students in a more casual setting, rather than through the lens of classes and grades. I typically make a few remarks at these dinners, and one of the many stories I like to tell is how Bissell House got its name. Before he became the President of U of T (1958-71), Claude Bissell (BA 1936 UC) was the UC Dean of Men from 1946 to 1956. He lived in what was then the “Dean’s House” with his wife, Christine. Their daughter, Deirdre (BA 1969 UC), was born while they were residents of the College. After he passed away, UC named the House in his honour. One afternoon, early in my first term, I was walking home and noticed two people looking at the House from the front gate. To my surprise, it was Christine Bissell - then in her 90s, now deceased - and her daughter Deirdre Macdonald (née Bissell)! I invited them to tea and had the pleasure of hearing their stories of post-war life on campus and, from Deirdre, what it was like to grow up at UC. 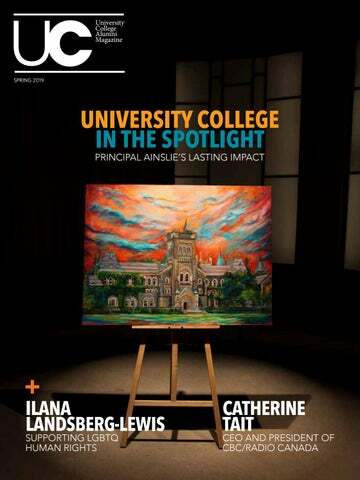 “DURING HIS TIME AS PRINCIPAL,PROFESSOR AINSLIE HAS GUIDED UNIVERSITY COLLEGE THROUGH A HIGHLY SUCCESSFUL REVITALIZATION PROCESS, HELPED TO SOLIDIFY THE COLLEGE’S FIRST YEAR FOUNDATIONS – UC ONE – AND HAS PROMOTED NEW COLLABORATIONS BETWEEN THE UC UNDERGRADUATE PROGRAMS AND SEVERAL GRADUATE UNITS” — PROFESSOR CHERYL REGEHR, VICE-PRESIDENT AND PROVOST OF U OF T Ainslie’s rapport with students and alumni has had an enormous impact on the revitalization effort. The UC Lit held a referendum on supporting the project with an increase to annual student fees, voting to contribute almost $2.1 million to renovating the college’s student spaces. After the levy passed, the student funds, which will be collected over a 20-year period, were matched by UC alumni Edmund (BA 1969 UC) and Frances Clark (BA 1969 UC), whose second major Revitalization donation will enable the UC quad to be upgraded once the interior renovations are finished. Their earlier gift in support of the Clark Reading Room anchored UC’s fundraising efforts for the Revitalization. UC alumna, donor and artist, Diana Bennett (BA 1965 UC) points to the Revitalization as a demonstration of Ainslie’s commitment to the college, but is also quick to note his guidance regarding the federation between the University of Toronto Art Centre (UTAC) at UC and the Justina M. Barnicke Gallery at Hart House, which took place during his tenure. The two galleries now operate under the umbrella of the Art Museum at U of T and share a common staff and programming strategy. The result has been a series of award-winning exhibitions, deeper academic links between the Art Museum and academic departments, record-breaking attendance, and a higher profile for both UTAC and the Barnicke Gallery. Bennett, chair of the UTAC Advisory Board during that time, saw firsthand how hard Ainslie worked to bring everyone together. “I view him as a marvelous administrator, with a foundation in his tremendous academic dedication,” says Bennett. 1 2011: Professor Donald Ainslie is installed as the 16th Principal of University College, University of Toronto. 2 2011: UC One program for first-year students launches with a founding gift from James Mossman. 3 2012: The Alumni of Influence awards are established one year into Principal Ainslie’s tenure. 4 2012: University College launches the Asian Canadian Studies minor offered by the Canadian Studies Program. In celebration of the launch, the Honourable Vivienne Poy, former Senator, and U of T Chancellor Emerita, delivers the inaugural lecture in the Asian Canadian Lecture Series. Thanks to an anonymous gift, UC later establishes the Richard Charles Lee Chair in Chinese Canadian Studies in 2013. 5 2013: Principal Ainslie with the 2012-13 UC Lit during a council meeting. 6 2013: The Cognitive Science program, under the guidance of Principal Ainslie, returns to the college. 7 2014: University College students gather to form a giant UC during orientation week. 8 2015: Principal Ainslie transformed into Dumbledore for the UC family and community Harry Potter event. 9 2016: The University of Toronto Art Centre (UTAC) at UC and the Justina M. Barnicke Gallery at Hart House, launch the Art Museum at U of T; the federation of the two galleries within this new identity is a result of the work and guidance of Principal Ainslie. 10 2017: UC hosts a groundbreaking event for the Revitalization Project. The revitalization increases the building’s accessibility with new ramps and an elevator; returns the library to its original home in East Hall; transforms West Hall into the Clark Reading Room and creates the Paul Cadario Conference Centre at Croft Chapter House. 11 2018: U of T President Meric Gertler attends a faculty-student dinner at Bissell House—a monthly dinner, which has become a UC tradition during Principal Ainslie’s tenure. 12 2018: Principal Ainslie takes students on a construction tour. Students stop to sign the walls of Croft Chapter House before new panelling is installed. 13 2018: A final Alumni of Influence celebration as Principal of University College. Ainslie finishes his term on June 30, 2019. UPDATE he Revitalization Project is in full swing and the end is in sight. When completed, the construction project will see the library relocated back to its original home in East Hall; West Hall transformed into the Clark Reading Room, a quiet study space; and Croft Chapter House become a full-service conference centre, thanks to a generous donation from Paul Cadario. Progress has been swift in the past few months. All major mechanical and electrical alterations are now in place, which will ensure proper cooling and heating. The first accessible ramp is finished, connecting the Croft Lobby to room 179. Structural reinforcement of the dome in the soon-to-be Paul Cadario Conference Centre at Croft Chapter House is complete and awaiting the installation of a chandelier (now in production) that will span the dome and improve acoustics. Millwork for the rooms is now in production and installation will begin during the spring and summer months. And the floor of the mezzanine in the new library is nearing completion. Exciting developments will continue to unfold over the coming months as the college prepares to unveil the magnificent transformation and updating of this historic building. In the fall of 2018, Ilana Landsberg-Lewis (BA 1988 UC), recipient of a UC Alumni of Influence Award in 2016, returned to the college to participate in the UC Salon Talk Series. The series invites prominent alumni to speak about their work and experiences and provide opportunities for our community to attend and participate in thoughtprovoking discussions. Landsberg-Lewisâ&#x20AC;&#x2122;s talk, A Personal Reflection: The Disturbing History of the United Nations (UN) and LGBTQ Rights, offered an insightful reflection on her experience working at the UN. As a follow-up, she has written an equally illuminating article. am passionate about the human rights struggle of LGBTQQIP2SAA people. It is a theme that has woven throughout my working life; however, I cannot claim to be an LGBTQ activist. In fact, my work has been more behind the scenes, and focused more on the institutional dimensions and challenges of trying to move things forward. n the age of streaming services, podcasts and social media, it is appropriate that Catherine Tait’s (BA 1979 UC) first major announcement, since being appointed President and CEO of CBC/ Radio-Canada, was the pre-launch in September of CBC Gem, a new CBC streaming service available (since December 11, 2018) on the CBC TV app. CBC Gem will offer films from Telefilm Canada and the National Film Board of Canada (NFB), as well as Canadian children’s programming, news and current affairs shows. The streaming of these “crown jewels of Canadian content,” as Tait calls them, is one more step in transforming the corporation into a digital powerhouse. Wade, who had been working with various startups and was previously an executive with companies such as BlackBerry and Samsung, spent most of his first meeting with Zhang simply getting to know him on a personal level. “He took a lot of time to ask about my background, where I came from, my interests and things like that. He also shared with me some of our similarities, because he worked in Asia. So after that first meeting, it made me feel a lot closer to him,” explains Zhang. Once they began discussing Zhang’s future plans, however, Wade wasn’t shy about sharing some professional advice and recommendations. In other words, mentorship relationships often go much deeper than simple resume polishing or interview training. The students and alumni “challenge each other to think in different ways,” says Bailey, and this can lead to lasting bonds. Such was the case with Daniel Zhang (BSc 2016 UC), a computer science and economics student who signed up for the program in 2014. As an international student, Zhang says one of his main motivations for participating was to build a professional network. After being matched with Greg Wade (BA 1990 UC), he found that and more. After interning for a year at a startup owned by an acquaintance of Wade’s, Zhang returned to U of T and enrolled in courses on entrepreneurship. This led to the inception of Chopin, a health-care data management startup that Zhang co-founded with U of T PhD student Carolina Gomes. And, Wade agreed to join Zhang’s team as a strategic advisor. The mentorship program, now in its 11th year, has witnessed a number of former mentees returning as mentors, Tian Wang being one. Hesitant at first, Wang returned to the program as a mentor this past fall. “At first I thought mentors needed to have lots of experience and be really established in their fields,” she explains, but it was Nash who once again gave her the boost to move forward. hortly after becoming the first joint faculty appointment to the Department of Computer Science and University College’s Cognitive Science program, Assistant Professor Yang Xu was interviewing candidates for a student work-study research project when Samin Khan walked into his office. “I knew right away Samin was the right fit,” says Xu. Khan was looking for research opportunities within the realm of psychology, cognitive neuroscience, and artificial intelligence. The Cognitive Science program piqued his interested. He was particularly looking to get involved in computational linguistics—how computers process language. The work-study project under the supervision of Rotman School of Management Professor Sridhar Moorthy and Xu seemed to be a perfect fit. Khan and Hamayal Choudhry—his teammate from the University of Ontario Institute of Technology—won the 2018 Microsoft Imagine Cup for the smartARM, beating out 40,000 competitors and taking home more than $130,000 in cash and grants. It was an auspicious beginning. Within a few months, Khan was not only wowing Xu with his work-study research on sound symbolism, but garnering international acclaim for coinventing the smartARM, a prosthetic hand that uses AI technology. The 3D-printed smartARM uses machine learning combined with a camera in its palm to assess and grip objects. For Khan, it was the perfect affirmation that he’d been right about Cognitive Science, an interdisciplinary program hosted by University College and supported by the four departments that intersect with it — Philosophy, Linguistics, Psychology and Computer Science. the University of Toronto Excellence Awards (UTEA). For example, Khan’s work-study program with Xu, in collaboration with Professor Sridhar Moorthy, focuses on predicting brand name gender. “My role as a mentor for Samin has been stretching him to deal with big data sets and thinking about ways to apply machine learning tools to analyze and test hypotheses,” says Xu. inexpensive by making use of readily available techniques and software. Xu says the Cognitive Science program encourages students to stretch their minds and apply their skills to realworld problems, whether it’s part of their course work or at brainstorming events like hackathons. Vervaeke, cross-appointed with Psychology – helped to solidify the program. And Xu says his appointment in early 2018 as the first joint tenure-stream faculty member was another key moment. A search is currently underway for a second tenure-stream hire, this time crossappointed with Linguistics. “In the near future,” Xu notes, “there will be more research faculty joining us from other departments who will continue to cultivate this environment for students, working in various capacities to open windows to research-orientated study.” The word is obviously starting to get out. Xu notes enrollment has swollen to between 350 and 400 students – up about 80 percent since 2009 – along with a growing interest in science that examines the intersection between the human mind and AI. ALICE WOOLLEY (BA 1991 UC), a professor at the University of Calgary, was appointed a Justice of the Court of Queen’s Bench of Alberta in Calgary. Health-care, finance and legal executive GARY MARGOLIS (BSc 1998 UC), was appointed to the role of Chief Executive Officer of Notogen Inc., a biotechnology company developing regenerative therapeutics for conditions related to spinal degeneration, orthopedics and sports medicine. Professor JEFFREY ROSENTHAL (BSc 1988 UC), Department of Statistics, University of Toronto, published a new book with HarperCollins Canada titled Knock on Wood: Luck, Chance, and the Meaning of Everything. He received the UC Alumni of Influence Award in 2012, and recently received the Presidential Impact Award for his efforts to improve a variety of societal problems through application of statistical analysis. MICHAEL ONDAATJE’S (BA 1965 UC) The English Patient, won the Golden Man Booker Prize for the “best work of fiction from the last five decades of the Man Booker Prize.” He received the UC Alumni of Influence Award in 2012. Lawyer JOHN MURRAY (BA 1984 UC) was appointed President & Chief Executive Officer of the Board of Directors of the Immigration Consultants of Canada Regulatory Council (ICCRC). MARK SCHAEFER (BA 1988 UC) has been appointed Chief Human Resources Officer of Kiadis Pharma N.V., a clinicalstage biopharmaceutical company based in Amsterdam, The Netherlands. JESSICA KIMMEL (BSc 1986 UC), partner at Goodmans LLP, was appointed a Judge of the Ontario Superior Court of Justice in Toronto. RACHEL BLUMENFELD (BA 1983 UC) was appointed to the Board of Directors of STEP Canada. STEP Canada’s primary purpose is to improve public understanding of the issues families face in relation to inheritance and succession planning. CAROL BANDUCCI (BCom 1986 UC), executive vice president and Chief Financial Officer of IAMGOLD Corporation, was honoured with a 2018 Canada’s Most Powerful Women: Top 100 Award by the Women’s Executive Network. She received the UC Alumni of Influence Award in 2016. JAMES BIRD (BA 2018 UC) was awarded the University of Toronto President’s Award for Outstanding Indigenous Student of the Year. University Professor Emeritus, LINDA HUTCHEON (BA 1969 UC), Department of English and Centre for Comparative Literature, received an honorary degree from Victoria University in the University of Toronto. She received the UC Alumni of Influence Award in 2012. TIM HENDRICKSON (BCom 1993 UC) was appointed to the role of Chief Financial Officer of HLS Therapeutics Inc., a specialty pharmaceutical company. Author THEA LIM’S (BA 2004 UC) novel, An Ocean of Minutes, was shortlisted for the 2018 Giller Prize. Professor DONALD ABELSON (BA 1985 UC) was appointed the founding Director of the Brian Mulroney Institute of Government, and the inaugural ECN Capital Chair in Canada-U.S. Relations at St. Francis Xavier University. Mining executive and geologist, NICK TINTOR (BSc 1980 UC) was appointed President & Chief Financial Officer and Director of Avidian Gold Corp. SOMANI NASEEM (BCom 1983 UC), chief executive officer of Dynacare, was awarded a 2018 RBC Top 25 Canadian Immigrant Award. LORNE MICHAELS (BA 1966 UC), executive producer of Saturday Night Live, was promoted to Companion, Order of Canada. He received the UC Alumni of Influence Award in 2012. NAV PERSAUD (BSc 2002 UC) was selected by the Toronto Star as one of 12 Canadians profiled for their series Changemakers. A family doctor at St. Michael’s Hospital, Persaud was selected for his commitment to patient safety, social justice, transparency and pharmacare. Past President of the University of Toronto, DAVID NAYLOR (1974 UC), received the 2018 Henry G. Friesen International Prize in Health Research for his contributions to and influence on health service delivery, public health, and health research funding. Naylor also received the UC Alumni of Influence Award in 2013. Dear UC Alumni, It has been a wonderful year for UC alumni and the University College Alumni Association (UCAA). The well-established and popular UC Alumni Salon series, the UC Career Mentorship Program, and the Young Alumni of Influence recognition program continue to be successful in enhancing the lives of alumni, recognizing their extraordinary achievements, and helping to inspire students. Since enacting a new Terms of Reference in 2017, we have been active in pursuing a more outward-looking approach with improved communications to facilitate a dialogue with our alumni community. We continue to work on ways to keep you abreast of alumni events and opportunities and currently have communications tools and strategies in the works. We hope our new initiatives will offer you better accessibility to your alumni association and its ongoing efforts on your behalf. Anthropology professor, and UC faculty member, TANIA LI received the prestigious 2018 Insight Award from the Social Sciences and Humanities Research Council of Canada (SSHRC) in recognition of her research, which significantly contributes to the knowledge and understanding of people, societies and the world. For the past two decades, Li’s work has focused on Indigenous highland communities in Indonesia. Li has also been appointed University Professor at the University of Toronto, the highest academic rank at U of T that is restricted to no more than two per cent of the tenured faculty. Tania Li also received the President’s Impact Award in February 2019 for her research on development policies and proposed equitable alternatives. University College Dean of Students, MELINDA SCOTT, received her PhD in higher education from U of T’s Ontario Institute for Studies in Education. After nearly 39 years of service, EVA MANDRAPILIAS, assistant to the Registrar, retired from U of T. Mandrapilias joined the UC Registrarâ&#x20AC;&#x2122;s office in 1980. Principal DONALD AINSLIE treated alumni and donors to a behindthe-scenes tour of the construction underway in the East and West Halls of University College, and Croft Chapter House. The Former Acting Vice-Principal of University College, CHRISTINA KRAMER, professor of Slavic Languages & Literatures, received a translation fellowship from the U.S. National Endowment for the Arts (NEA). The fellowship will allow Kramer to translate Grandma Non-Oui, by Macedonian writer Lidija Dimkovska. University of Toronto Professor Emeritus GEOFFREY HINTON was awarded The Toronto Board of Trade award for Visionary Leadership. The 7TH ANNUAL ALUMNI OF INFLUENCE AWARDS honoured 21 UC alumni, recognizing their career and personal accomplishments. It was PROFESSOR DONALD AINSLIE’S final awards ceremony as Principal of University College. The event began in the first year of his first term, in 2012. University College faculty members, PROFESSOR ALAN ACKERMAN, Department of English and the Centre for Drama, Theatre and Performance Studies, and PROFESSOR MARK CHEETHAM, Department of the History of Art, have been awarded Jackman Humanities Institute Faculty Research Fellowships for 2019-20. UC Alumni Relations launched WORDS OF WISDOM, a new program that engages alumni and firstyear students. Alumni submit notes offering advice to new students. The inaugural year was an enormous hit with 120 heartfelt messages submitted and shared with students during orientation week. UC student and golfer, ELLICE HONG, won the Ontario University Athletics (OUA) championships along with the women’s Blues Golf Team for the 7th consecutive year. Hong was also named to the OUA All-Star First Team. UC student, and Varsity swim team member, ELIJAH WALL, was celebrated as the U SPORTS top scholar athlete, at the 20172018 Top Student athletes Ninth Annual Academic Excellence Breakfast. 19 other UC students were recognized as studentathletes for earning an 80% average in their courses while competing on a Varsity team. chair position was established to study how the new era of artificial intelligence will affect our lives. UC faculty member, SEAN MILLS, Department of History, was named to the Royal Society of Canada’s College of New Scholars. He is also the Canada Research Chair in Canadian and Transnational History. The ART MUSEUM AT THE UNIVERSITY OF TORONTO hosted the award-winning exhibition Far and Near: the Distance(s) between Us by Master of Visual Studies, Curatorial Studies student Henry Heng Lu. Lu received the Exhibition of the Year award for his curatorial project. IN MEMORIAM Notices of death published in this issue were received between May 16, 2018 and November 30, 2018. Date of death, last known residence, and maiden name (if applicable) are noted where possible. Friends and family of the deceased can help by sending information to address.update@utoronto.ca. I have included UC in my will and have not yet notified the college. Please call me to discuss how to leave a gift for the college in my will. Please do not publish my name in donor listings. Continuous monthly donations starting ____/____/______ *Monthly donations will continue in prepetuity; however you can cancel at any time. OUR PROMISE TO YOU: We will mail you a tax receipt and acknowledgement of your donation. University College at the University of Toronto respects your privacy. The information on this form is collected and used for administration of the University’s advancement activities undertaken pursuant to the University of Toronto Act, 1971. At all times it will be protected in accordance with the Freedom of Information and Protection of Privacy Act. If you have questions, please refer to www.utoronto.ca/privacy or contact the University’s Freedom of Information and Protection of Privacy Coordinator at (416) 946-7303, McMurrich Building, Room 201, 12 Queen’s Park Crescent West, Toronto, Ontario M5S 1A8. Charitable registration number: BBN 108162330-RR0001 Thank you for your generosity! WISDOM Words of Wisdom can include notes of encouragement, congratulations or things you wish you knew when entering U of T. Notes will be given to first-year students during Orientation Week. Do you have advice for our first-year students? Send us your Words of Wisdom and help us inspire UCâ&#x20AC;&#x2122;s next generation. For students beginning their journey at UC, receiving your Words of Wisdom note will be a source of inspiration throughout their years of study and beyond. Submit your Words of Wisdom note at uc.utoronto.ca/wow by Wednesday, July 31, 2019. If you have any questions, please contact UC Alumni Relations Officer, Mike Henry, at mike.henry@utoronto.ca or (416) 978-2968.